Tiger Woods achievements to date rank him among the most successful golfers of all time. He was the highest-paid professional athlete in 2008, having earned an estimated $110 million from winnings and endorsements. Jack Nicklaus, also known as "The Golden Bear" was continuously ranked as the world's number one golfer on McCormack's World Golf Rankings from its inception in 1968 to 1977. 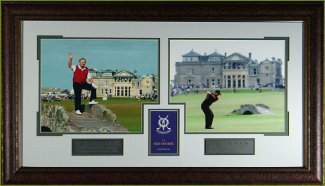 Custom Leather Framed Approx: 17X31 and Premium Matted as shown with descriptive plaque and British Open Scorecard.